Superior protection at a great price! Quality Nitrile formulation offering great fit at value price. Textured fingertips for effective grip in wet and dry conditions. 5 mil with super strength & stretch. How much are your hands worth? Advanced formulation provides ultimate comfort, fit and feel. 6 mil thickness provides super strength, stretch and protection. Fully textured grip provides advanced wet/dry performance. Air tested, quadruple washed and approved for medical use. When you need to be seen! When you need a little extra! 9 mil thickness and 12" cuff provide superior barrier protection. Custom formulation provides ultimate strength, fit & feel. Textured fingertips provide reliable grip in wet/dry conditions. Powder free, quality tested and approved for medical use. 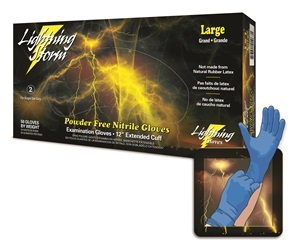 Lightning Storm 12” extended cuff nitrile glove. The longer cuff length and 9 mil thickness provides exceptional comfort and protection. Our Black Lightning®, Orange Lightning®, and InTouch® B311 are the most advanced disposable gloves - protecting law enforcement personnel from accidental fentanyl exposure. Our gloves inside and out. You count on them to earn a living, to care for your family, to experience life. Your hands are an integral part of who you are. Let us help you protect them, so they’ll always be there for you. ASP up close and personal. 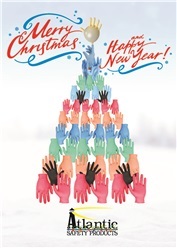 More than just a glove company, we’re the ultimate mix of people, products and systems. Take some time to learn about us -- who we are, what we do and where we’re going -- and experience the Atlantic Safety Products difference. The perfect fit for your needs. The word “fit” can mean many things. It can describe the way a glove “fits” your hand or the way an organization “fits” your vision or even the way a product “fits” your budget. In each case, the word “fit” can be used to establish what is important to you, our customer. Whether consumer, distributor, private labeler or partner, let us know how we can best “fit” your needs. Your guiding light in hand protection. Knowledge is empowering. It can be the difference between making a good decision and a regrettable one. Good decisions are what we’re all about. Let us help you understand when, why and what to wear for hand protection and how you can arm yourself with the knowledge to always make a good decision. A lost art, service was once the standard for American business. A sense of ownership, pride and accountability was felt within the employees of an organization and permeated through their interactions with its customers. Well, we’re still holding on to the past and try each day to hold true to the standards set by those before us. Take a look online to find answers to most of your service-related questions but know, if you can’t find it here, we’re just a phone call away.